Materials: One skein of worsted weight cotton if you are using the bib for meals. If, on the other hand, you want to use it as a “drool” bib, I recommend using a superwash wool. The cotton has a tendency to absorb the moisture, whereas the superwash wool will wick the moisture and keep baby nice and dry! 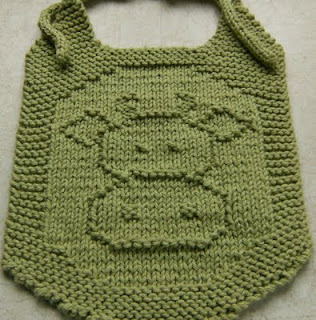 The bib pictured was done in Peaches & Crème in Celery. When you reach the I-cords on the bib, it is helpful, but not necessary, to drop down a needle size to make the cords slightly tighter. Pattern: Cast on 11 sts. Row 12: k13; p11; k13. Row 14: k11; p15; k11. Row 16: k9; p19; k9. Row 20: k5; p7; k1; p11; k1; p7; k5. Row 21: k11; p1; k13; p1; k11. Row 22: k5; p5; k1; p15; k1; p5; k5. Row 23: k10; p1; k15; p1; k10. Row 24: k5; p5; k1; p15; k1; p5; k5. Row 25: k10; p1; k3; p2; k5; p2; k3; p1; k10. Row 26: k5; p5; k1; p3; k2; p5; k2; p3; k1; p5; k5. Row 27: k10; p1; k15; p1; k10. Row 28: k5; p5; k1; p15; k1; p5; k5. Row 29: k11; p1; k13; p1; k11. Row 30: k5; p7; k1; p11; k1; p7; k5. Row 31: k13; p1; k9; p1; k13. Row 32: k5; p9; k1; p7; k1; p9; k5. Row 33: k13; p1; k1; p7; k1; p1; k13. Row 34: k5; p7; k1; p11; k1; p7; k5. Row 35: k11; p1; k13; p1; k11. Row 36: k5; p6; k1; p13; k1; p6; k5. Row 37: k11; p1; k13; p1; k11. Row 38: k5; p6; k1; p13; k1; p6; k5. Row 39: k11; p1; k4; p1; k3; p1; k4; p1; k11. Row 40: k5; p4; k3; p13; k3; p4; k5. Row 41: k8; p1; k2; p1; k13; p1; k2; p1; k8. Row 42: k5; p2; k1; p3; k1; p13; k1; p3; k1; p2; k5. Row 43: k6; p1; k5; p1; k11; p1; k5; p1; k6. Row 44: k5; p1; k1; p6; k1; p9; k1; p6; k1; p1; k5. Row 45: k7; p1; k4; p1; k1; p1; k7; p1; k1; p1; k4; p1; k7. Row 46: k5; p3; (k1, p2) X 2; k9; (p2, k1) X 2; p3; k5. Row 47: k9; p2; k3; p2; k5; p2; k3; p2; k9. Row 48: k5; p8; k3; p5; k3; p8; k5. Row 49: k13; p2; k7; p2; k13. Row 50: k5; p8; k2; p7; k2; p8; k5. Row 51: k14; p2; k5; p2; k14. Row 52: k7; p23; k7. Row 54: k9; p19; k9. Row 56: k11; p15; k11. Row 58: k13; p11; k13. Rows 59 – 64: knit. Row 65: knit 13 stitches; bind off the next 12 stitches knitwise, and knit the remaining stitches. You should have 13 sts. on each side. Note: As you look at the bib, this will be the left side. All the decreases are made on right side rows. I have included a couple of tips below. Join yarn to neck edge and work right side to correspond to the left side. Oops, rows 10 and 11 don't add up. If we're casting on 3 stitches, doesn't that make 36 and 39? Are we supposed to be casting on 2 stitches, to end up with 37? Please tell us the best way to add stitches in the beginning of a row to look the best. It's very cute, I'm going to cast it on pretty soon! How do you end when you don't want the ties? I hate to do this to you, but isn't that row 65 from a seed stitch border? Shouldn't it just be k13 for the garter stitch border?